Quite truthfully, Alisa was one of the hardest workers we ever had! Alisa has always been a high octane go-getter since early childhood and surprised me by actually asking if she could work at our farm. My pet name for her was Tiger for reasons that will become obvious. During the late 1980's we had been troubled by a few vandal prone kids who seem to like peppering every object at the farm with their new air rifle. I would usually place a polite call the St. Charles County Sheriff who always seemed to arrive after the kids had left. After several incidents like that, Alisa became convinced that some more forceful countermeasures need to be taken. When Alisa got that resolute look on her face I knew that someone was in for some very deep, trouble indeed! Fortunately (rather unfortunately for the vandal), the next time the kid with the air rifle showed up was while we had customers in the field. Alisa placed a "panic" call to the St. Charles Sheriff's office saying that one of our customers "could be" shot by this miscreant if something isn't done quickly. I never knew the Sheriff's office could react so quickly; in a few minutes a squad car arrived and the miscreant was apprehended. That was the end of our air gun vandalism problems for good! When customers used to ask what will happen to the farm when I get too old to run it any more I used to say it would be turned into a horse farm -- Alisa's one true love (except for her husband Andy, of course). 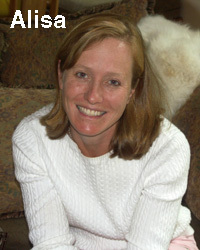 Alisa is currently a Sr Director Global Strategic Marketing at Allergan who makes Botox, Dry Eye products like Restasis & Refresh, Tazorac, and several others .